Bits in Motion: View the source right inside the test runner! Graham Hay has been working his magic on Icarus, the Gallio test runner GUI. 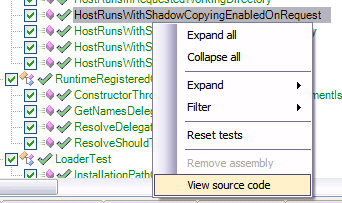 Recently he added the View source code feature. Source information is also used in other places. The command-line test runner, MSBuild, NAnt and PowerShell tasks also display source code location information as part of the test results. The source code location is included in XML reports, of course. However, I'm still not sure how to effectively present this information in an HTML report. Any ideas?